Coconut.co – Asia : Who’s up for a Rossa x Super Junior collaboration? The partnership between behemoth K-pop agency SM Entertainment and Indonesian media company Trans Media (along its parent company, CT Group), was signed last year but is finally starting to bear fruits for fans of Korean and Indonesian pop music. As previously reported, the joint venture of the two media giants will take the form of, among others: talent management, advertising, content production, digital content distribution, and merchandising or lifestyle business. But their most ambitious project of all is birthing an Indonesian K-pop equivalent called I-pop. 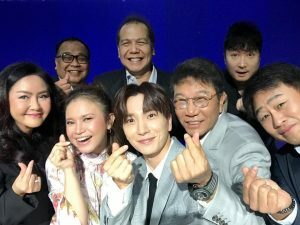 It appears the first I-pop project will be a collaboration between the veteran boyband Super Junior (Suju) with renowned Indonesian singer Rossa, who became the first talent to be signed to the joint venture. Reports indicate that they will release a new song together sometime in the middle of this year. The collaboration was confirmed by Suju’s leader, Leeteuk, through posts to his Instagram account that featured the hashtag #NantikanKami (#WatchOutForUs) hashtag. Super Junior is among the second generation of talents from SM Entertainment, debuting in 2005. They have since become one of the country’s most iconic K-pop acts, helping to spread the Hallyu Wave all over the world. Rossa is one of Indonesia’s most famous pop divas, with a career spanning over 22 years. Many of her songs were featured in Indonesian blockbusters such as Ayat-Ayat Cinta (Verses of Love), and she has been honored with the Dato’ Sri title in Malaysia. Earlier this month, SM Entertainment opened its first Indonesian office at fX Sudirman mall in South Jakarta, much to the delight of the country’s legion of K-pop fans.